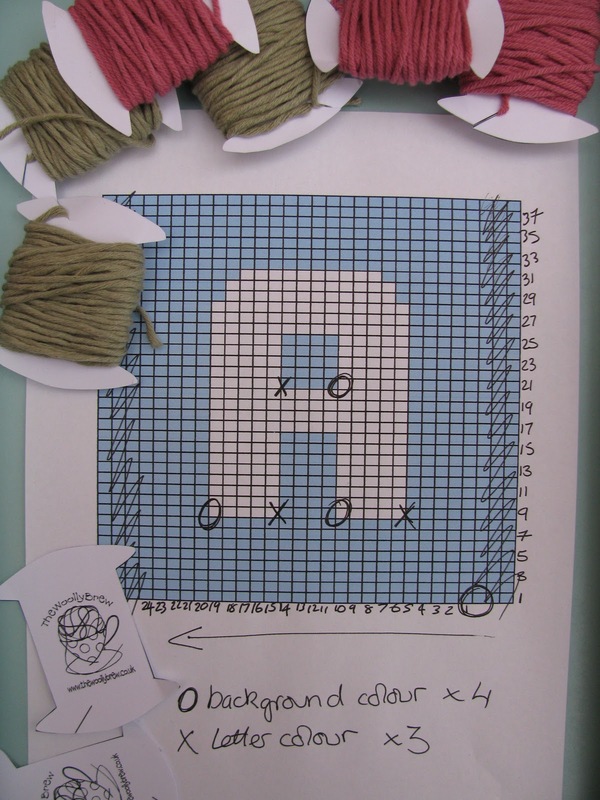 Knitters at The Woolly Brew stitching group are helping to knit a poem for the Stanza poetry festival in St Andrews. You can read about it here. I have been assigned A and N, Karen has been assigned T and E.
I have never done any colourwork before and if I'm honest it always looked abit complicated! Stranded and intarsia are the most common terms, and there is illusion, mosaic and corrugated ribbing! For the letter blocks needed for the Knit a Poem project we are using the intarsia technique. There is a lot of good information on the internet on Intarsia, I will not repeat it here but instead give some personal tips which we hope will be helpful. Intarsia uses different balls of yarns to create blocks on colour. Unlike stranded you are only using one yarn at a time leaving the unused yarn hanging at the back. When you change colours you twist the yarn together to stop a hole forming. 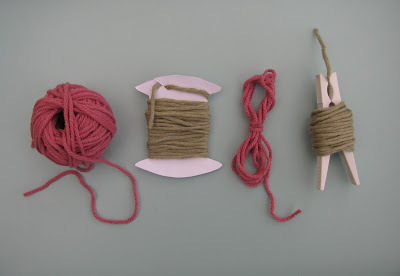 You can use small balls or yarn wound onto bobbins. Tip 1 - These balls or bobbins should be kept close to the knitting - don't unwind until you need the yarn or you'll get into a tangle! You can buy bobbins or make your own from some card or pegs. 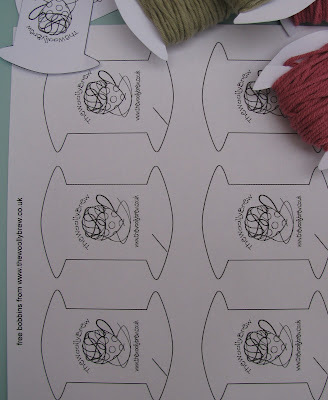 You can download some Woolly Brew bobbins here (you'll need Adobe Acrobat). Intarsia knitting is usually worked from a chart. Tip 2 - It is a good idea to copy the chart and sometimes it is better to enlarge it too so you can see the pattern clearly. Each square on a chart equals one stitch of your knitting. The chart shows the right side of the knitting. Many intarsia patterns are in stocking stitch. So you knit the right side rows (1, 3, 5, 7 and so on) and purl the wrong side rows (2, 4, 6, 8....) You can mark off the rows as they are worked. 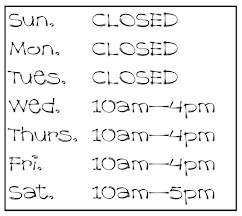 Your chart may not have numbers, it may be helpful to write them on your copy. Tip 3 - Make up your balls or bobbins before you start to knit. To work out how many changes of colour there are look at the chart and mark each colour change. So for the letter A I need 4 balls of my background colour and 3 balls of my letter colour. Tip 4 - A way to calculate how much yarn you need for each colour block is to count the number of stitches in the chart area. Wind the yarn around your needle (not too tightly) once for each stitch and unwind. add another 25% and a further 30cm (to allow for 15cm tail at each end). Be generous as its very annoying to run out of yarn! Wind this amount of yarn onto a bobbin or into a ball. Tip 5 - If you are winding into balls make a centre-pull ball. This will reduce any ball rolling and tangles with other balls. There is a nice photo tutorial here for winding a centre pull ball on your thumb. In researching this article I discovered butterflies - ideal if you're using small amounts of yarn. There is a nice video here. There are lots of ways to manage your balls - especially useful if you are doing a large project. You could keep them in bowls, jars, a shoe box with dividers, or bags. When you are ready to knit - cast on and start in your usual way. When you come to a colour change in the chart you need to join in a new ball. Knit with this new colour, leaving the 'old' colour dangling at the back. Only unravel the yarn as you need it so you don't get tangled! Continue in this way, joining new colours or picking up 'old' colours as you need them to complete the chart. 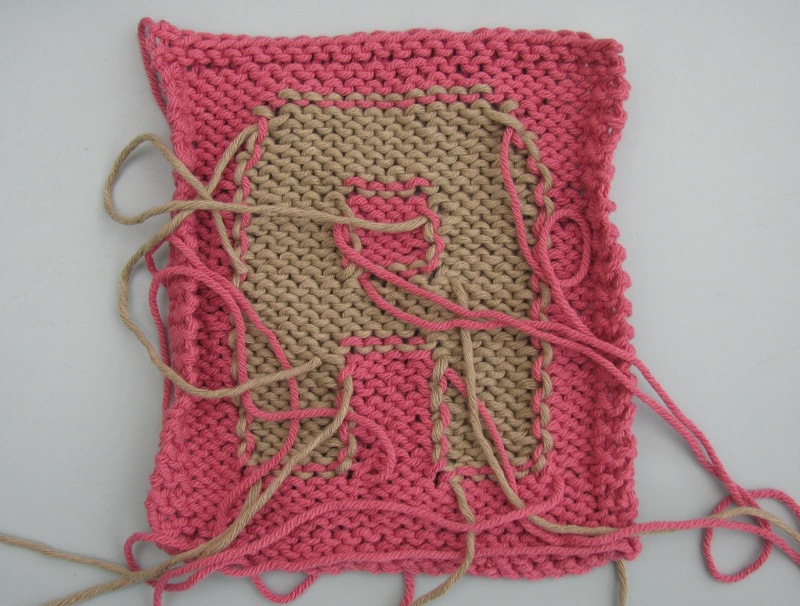 I have to admit in the small project of knitting a letter A I got tangled frequently! On a purl row - purl as normal until you need to change colour. Put the needle into the next stitch as if to purl and then pull the 'old' yarn to the left bringing the new colour up and over to purl the stitch. When you do it it makes sense! These 'twists' will give you a colour change on the vertical line. When you have finished knitting you will have lots of ends to weave in. Tip 8 - make sure you leave a long enough tail to weave in. Tip 9 - Weave the colours into the back of the same coloured knitting. When weaving in the ends you can also tighten up the stitches and improve the look of the right side of your knitting. This was a Very Beginners Guide to Intarsia. We hope it will give you some encouragement to try it yourself. Watch out for a Very Beginners Guide to Stranded Knitting next! Your tips hit the spot. Thanks! This is EXACTLY what I've been looking for! I understand intarsia knitting, but I get so confused with the pattern and how many balls of each color I'm going to need. Marking each color change is super helpful, so thank you! Just tried it at our end and it works fine. Not sure what the problem could be. If you'd like a copy you can email us and we'll forward a copy on.